For over 30 years, Clark's Farm Market has been offering a wide array of fresh locally grown produce, baked goods, flowers, and plants in central Ohio. 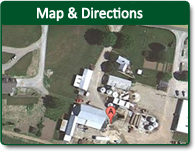 We are conveniently located in Springfield Ohio just a short drive from Dayton and Columbus. Be sure to check our site often for new specials and events. Stop by and experience a taste of the country! * Please note: Based on unfavorable weather conditions or product supply disruptions some items may not be available at certain times. For more information, please complete the form below and we will contact you shortly.